These gloves are from Echo , which I have to tell you I love love love... to look of course. Since I never seem to shop for me - HELLO I have to teen.. remember? LOL..
Two cards that are the same, but different. I love this! It makes me cheery! Don't these cards just make you smile and cheer you up? Using the Just So Sayings that I wont give up- even if the rubber is falling off some of the sentiments since they have been used so much. Turning the card, and dropping the saying, since I want it for those "OH I NEED A CHEERY CARD" occasion. 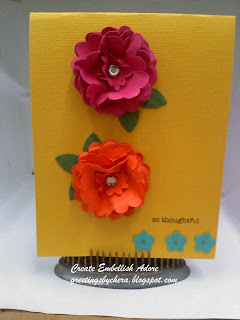 I love the flowers, scrunching the punched cardstock and then putting the brad in the middle. Love the look! And they came together very quickly! Super cute! I'm gonna have to try making these. Thanks for sharing!! These are some super cute and cheery cards! 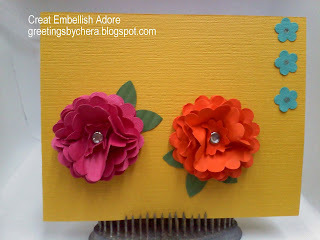 I love the combo of colors you used and the dimension of the flowers are perfect! I love anything that jumps off the page or card front like these. Thanks so much for sharing.